What other words rhyme with “-ive”? I get that it’s not really all that important to this Neurogenika review, at least insomuch that it answers the question: Does Neurogenika work? — …but I’ve spent quite a bit of time already trying to think up words that rhyme with Neurogenika’s “STRIVE”. Okay, enough. We’ll have to save that project for another day. For now, let’s get on with the Neurogenika review. Judging by the products’ clean design and “vegan friendly” emphasis, this nootropic supplement seems like a genuine health supplement. But perhaps that’s just what they want us to think… Let’s read the review to find out. Neurogenika Review: Thrive, Revive, Survive, Etc. From Roland Symonds, founder of Neurogenika, comes a three-in-one “cognition-enhancing” nootropic stack, including THRIVE, REVIVE, and SURVIVE. THRIVE: an herbal trio of popular nootropic adaptogens, advertised to improve memory, focus, and mental energy. 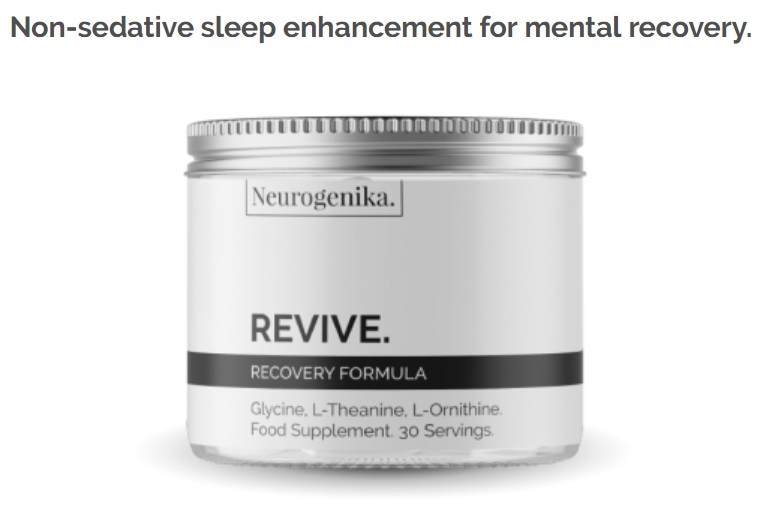 REVIVE: the non-sedative sleep enhancement stack for mental recovery, because what use are nootropics to a tired, inoperable mind? 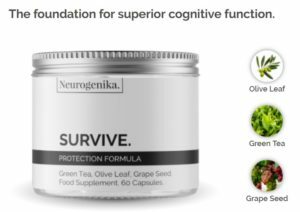 SURVIVE: a blend of plant-extracted polyphenols to boost neuroprotection and neuroregeneration for cognitive longevity — i.e., survival. Other Ingredients: Brown rice flour (bulking agent), hydroxypropyl methylcellulose (capsule). Directions: One serving (two capsules) per day. Do not exceed the recommended intake. Vegan friendly. Other Ingredients: Product label only lists Glycine, L-Ornithine HCL, L-Theanine. Directions: One heaped scoop (3.6g) mixed with water. Take 30-60 minutes before sleep. Do not exceed the recommended intake. Vegan friendly. You’re really busting my balls here, Neurogenika. When I took on this Neurogenika review, I thought I was only writing up a simple nootropic product review. Not three nootropic product reviews! Rhodiola Rosea Extract (3% Rosavins, 1% Salidrosides) – Morning, afternoon, or night — there’s almost never a bad time for Rhodiola. Especially Rhodiola extract standardized to 3% rosavins, 1% salidrosides. Few natural nootropics work as quickly and powerfully as Rhodiola in terms of reducing fatigue and clearing the mind for a few more hours of solid work. More on Rhodiola Rosea. Bacopa Monnieri Extract (50% Bacosides) – If you search natural nootropics, odds are you’ll read several lists with Bacopa monnieri somewhere near the top. As far as cognition enhancement goes, Bacopa is one of the best, particularly for memory and learning — an excellent nootropic herb for students. More on Bacopa Monnieri. Ashwagandha Extract (5% Withanolides) – Ashwagandha is an awesome multi-purpose herb, with some users favoring it for its strength and testosterone benefits; others for its anxiety and stress reduction effects. I simply like Ashwagandha — it’s a great feel-good adaptogen with quick, noticeable results. More on Ashwagandha. Glycine – Muscle, joint, immunity… sleep. Glycine is a popular amino acid among bodybuilders, yet Neurogenika seems to include it for its sleep and subjective sleep quality benefits. This 3g is a decent amount of glycine, enough to improve sleep quality. L-Ornithine – Study conclusion: “L-ornithine supplementation has the potential to relieve stress and improve sleep quality related to fatigue, both objectively and subjectively.” Noice. Another fine addition to this “non-sedative” sleep stack. L-Theanine – Who doesn’t like L-theanine? As a natural anxiolytic sourced from green tea, this amino seems to improve mood and mental performance by promoting alpha brainwaves — the brain state associated with calm, meditative creativity. As a nootropic, L-theanine pairs well with caffeine. More on L-Theanine. Green Tea Extract (40% EGCG) – Standardized to 90% polyphenols, 40% EGCG, this green tea extract is potent, supplying a nice mix of neuroprotective antioxidants for longer lasting brain health. Olive Leaf Extract (20% Oleuropein) – I understand the thinking on Olive Leaf Extract: olive oil is great for cognitive longevity, therefore supplementing the bio-active constituents of olive leaves should work, right? And there is positive animal research on this stuff, but I’m not 100% sold that oleuropein supplements work that well on humans. Grape Seed Extract (95% OPC) – Another hot, antioxidant-rich extract, supplying a popular mix of grape polyphenols — e.g., resveratrol, pterostilbene. Great for brain and body health. More on Pterostilbene. In terms of formula design, each Neurogenika product seems to have a clear vision and identity, showcasing an impressive stack of natural nootropics and ingredients that have the clinical chops to justify their inclusion. And Neurogenika does an awesome job at listing the clinical studies relevant to the ingredients used in these formulas. Perhaps what’s more impressive than that is how Neurogenika actually abides by the parameters set by the clinical research. 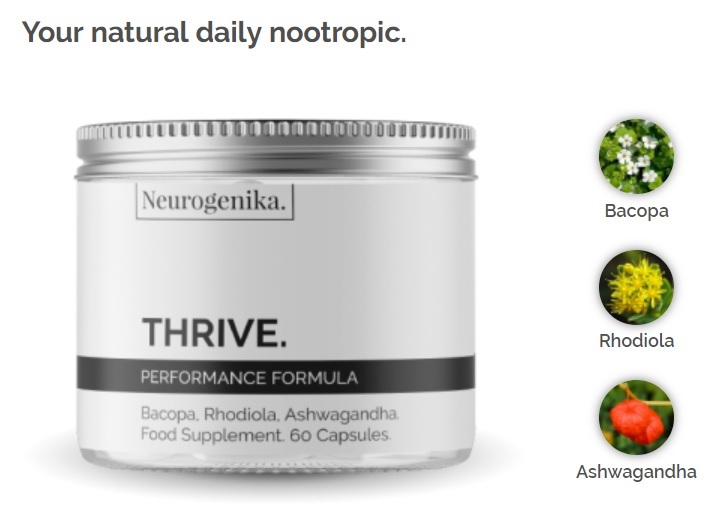 For example, the Bacopa extract dosage used in this study (cited by Neurogenika) is the same dosage used in the THRIVE formula. 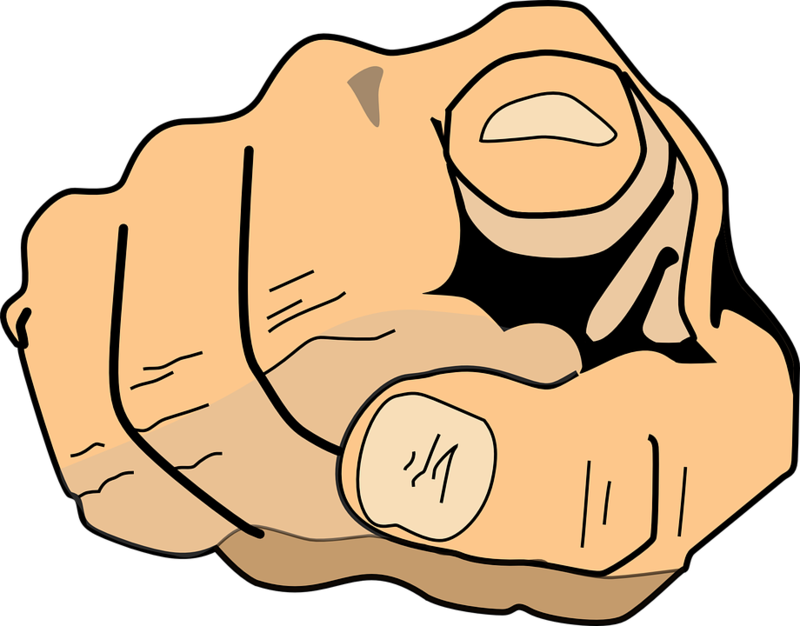 Few manufacturers actually adhere to the clinical research they reference (if they reference any research at all). However, this comes at an obvious cost for Neurogenika: nootropic diversity. Because Neurogenika does such an awesome job with each nootropic, this gives Neurogenika less capsule/scoop space to invest in more awesome nootropics. Not that this is necessarily a bad thing: I’d rather have a few nootropics that work than a bunch of low quality, sprinkled junk. But I’ve seen larger nootropic supplements that supply a more diverse range of ingredients, and they seem to make it work. Plus, when I see über-vegan supplements such as Neurogenika, I have to wonder if simply eating the actual plant sources is better than taking the supplements. With regards to Neurogenika, this wonderment only came about when I read the SURVIVE Supplement Facts. Either way, Neurogenika is an impressive stacks-on-stacks-on-stacks nootropic product of exceptional quality and quantity. Certainly worth a try. What do YOU have to say?? “Neurogenika exists because we wanted to use these products. But nobody else was making them. Why was that? We couldn’t understand it.” — quoted from Neurogenika’s “Our Story” page. This line, in addition to many other lines on Neurogenika’s story, is, ehm… sort of silly. First of all, there are plenty of nootropic supplements that use these nootropic ingredients. Rhodiola, Bacopa, Ashwagandha — these are incredibly popular adaptogens found in many, many supplements. Perhaps Neurogenika literally meant “these products” as in these exact dosages, extracts, etc. But even so, it’s really not the most unique formula design. Also, there’s quite a bit of strawmanning going on in Neurogenika’s “How We’re Different” section, in which they compare what “They Say” (they?) to what “We Say” (we = Neurogenika). Example: “They say: ‘style over substance’ / We say: ‘nothing but the best'” …who says “style over substance”?? I’m willing to bet that most supplement manufacturers also claim to sell “nothing but the best”. Having said that, Neurogenika’s “story” is worth the read, if you ignore the self-righteous nonsense — there are useful tidbits of supplement wisdom sprinkled throughout the page. Neurogenika earns its all-natural status with its all-natural nootropic stacks, sticking solely to Earth-grown ingredients and compounds. No proprietary blend BS here. Neurogenika seems genuinely proud of its products, transparently showcasing its ingredients and ingredient dosages. Clinical research is given for each ingredient to explain and justify their inclusion in each stack. Pricing options. If you’re only into one or two of Neurogenika’s stacks, then you may be only one or two of Neurogenika’s stacks. They don’t force you into buying all three products with each order. In terms of sheer brainpower, Neurogenika isn’t fully there. Rhodiola and such may help, but most of Neurogenika’s bio-activity emphasizes long-term health over immediate boosts. The SURVIVE stacks supplies some impressive antioxidants, yet, again, I have to wonder if simply eating the real thing might not be more beneficial than this. Neurogenika’s Story. This really has nothing to do with the supplements themselves and has everything to do with me being nit-picky, but the “Story” triggers my BS detector just a little. NOTE: The pricing options for the “complete cognition-enhancing toolkit” (STRIVE) are somewhat wonky. You may purchase the “Subscribe & Save” autoshipment plan for $69.00/month (marked down from $76.67/month, which… may or may not be a real price option). Or you can make a one-time purchase of $72.38, “marked down” from $79.78. So, purchasing the subscription options saves you $3.38/month, or something. I think. The THRIVE Subscribe & Save option amounts to $31.50/month. The REVIVE Subscribe & Save option amounts to $18.90/month. The SURVIVE Subscribe & Save options amounts to $26.10/month. 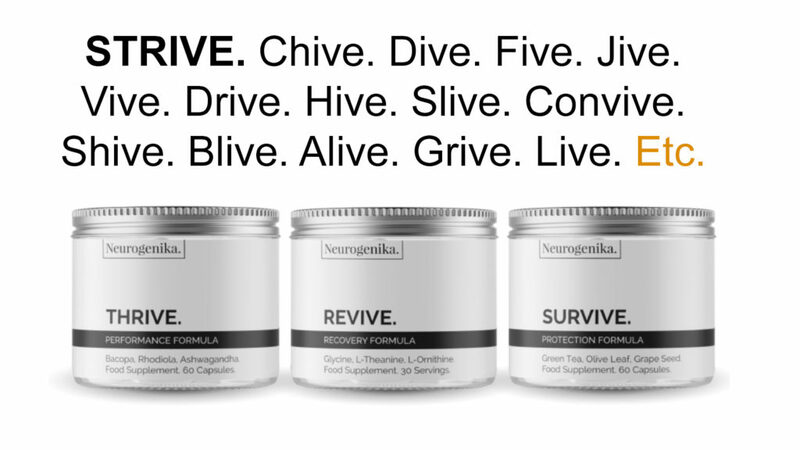 Anyone who wants to thrive, revive, and survive — or simply STRIVE — may benefit by Neurogenika. All jokes aside, Neurogenika seems to take pride in its vegan, plant-powered design, appealing to a more clean, green nootropic community. The inner troll in me wants to poke fun at the vegan community here …but as far as supplements go, I actually really dig the herbal vegan route. Focusing on all natural ingredients, capsules, and powders allows Neurogenika to reach both vegans and non-vegans alike. To that I say: Cool! You can buy Neurogenika through the Neurogenika website. To buy each formula individually, you can find their respective pricing options on their respective pages. Neurogenika also offers free shipping and a money back guarantee. All good stuff …but, yeah, no — no Amazon deals here, ladies and gents. Does SURVIVE work? Yea, sure. So, yeah, I’d say Neurogenika works. And I’d go even further than that and say that Neurogenika works very well, at least with regards to the few bio-benefits advertised for each stack. Despite the three separate formulas, I wouldn’t consider the sum total of Neurogenika as a one-and-done nootropic stack. There are other key brain benefits not covered by Neurogenika’s highly focused nootropic design. But if these are the exact brain benefits that you’re searching for, then this all works in your favor: Neurogenika does what it does very well.